The Eltek Trilogy DC power system is powered by the Flatpack2 line of power modules. With a maximum depth of 15 inches, the Trilogy system brings the Flatpack2 modules to applications where space is limited. Use of established components—including the efficient and reliable Flatpack2 rectifier, the robust Smartpack controller, and remarkably flexible distribution—make for optimal system design and cost-effective deployment. 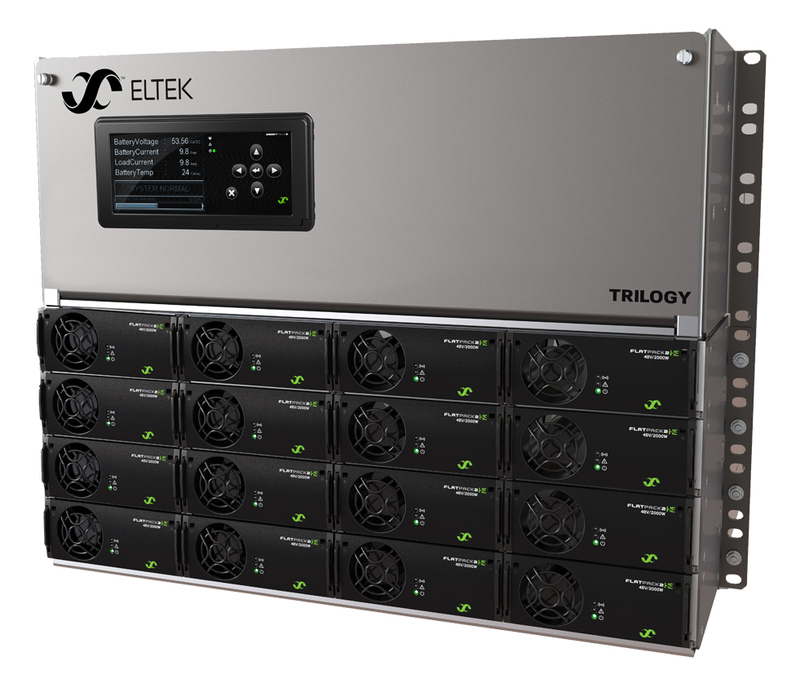 The Eltek Valere 48V Flatpack2 HE rectifier provides reliable DC power at an unparalleled typical efficiency of 96%. It is a hot-plug, digital switched-mode power supply module that operates on a wide range of input voltages (85 to 300VAC) and provides 2000W. The power shelf holds up to four rectifiers and mounts into standard 19” and 23” telecommunications racks.